Ibexes are the most common inhabitants of highland rocks and meadows. Caucasian Ibexes are endemic that is they are met nowhere but in this mountainous land. They stay there through all seasons. When a winter is much-snowing, a part of them, mostly females with yearlings, come down to the forest-belt rocks. The Caucasian Ibex is one of the most numerous ungulate species, the flocks of 100-150 specimens being not rare. In summer, full-grown males keep independently or in groups apart from females with the yearlings, but mixed flocks an also be met especially in saline land. Ibexes migrate little, some flocks staying in certain tracts maybe for decades. On summer days, groups usually comprising 20-40 animals keep on ridges of mountain ranges and in ice circuses. In evenings, Ibexes come down from rocks and pasture on subalpine meadows, bushing moraines and screes and sometimes enter the wood. Groups start dismembering after the first strong snowing through late September and early October, and animals gradually concentrate in wintering places. They prefer subalpine meadows on southern slopes and rocky massifs with the sparse growth of trees. On November's last days, the first mixed groups form. If December is warm and dry, rush is intensive and usually finishes by mid-January. First kids are born in late-May, and massive kidding usually occurs during the second half of June. Yearlings make 20% of ibex population in August-September, and only half of the young survive till the end of their first year. They die from harsh temperature declines, usual for highland in summer and especially autumn months, and become predators' prey. Avalanches are dangerous for full-grown specimens, mostly for males. 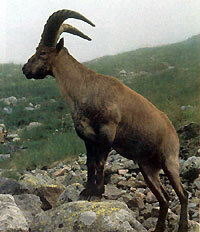 Nowadays, there are about 15,000 of these endemic animals in Azerbaijan. Life conditions in mountains are very different from those in lowland. Climate changes with climbing, temperature getting lower, wind stronger, air rarer, and winter longer. Flora is also different towards the top, desert and plain foothills being usually followed by the woods, which, in their turn, are replaced by low subalpine trees crooked down the slope and bushes, and then by alpine low flora far resembling that of northern tundra. The alpine belt directly borders snow fields, glaciers and rocks; there is only scarce grass, moss and lichen seen between stones. It is where many animals strange for plains are seen such as different species of mountain goats (the Alpine Capra Ibex (Western Europe), Caucasian Ibex, and Siberian mountain goat in Asian highland). Various methods can be used when hunting an ibex. The most difficult one is hiding. If a hunter makes even the smallest mistake: a careless noise or unnecessary move - he/she is the most likely to be discovered with no chance to shoot. Successful hiding is possible even in small areas because ibexes have great affinity with their habitat and will only leave it if strongly troubled e.g. by people and dogs entering either in the hunt season or at other times. A hunter who wants to hide in an unknown place had better learn about it. In any case, he/she is going to need a binocular, telescopic sight and clothes unseen on-ground during the season. Though rain and wind are not too pleasant, the noise and moving of branches help a hunter to approach the animal. Besides coming from the leeward side one needs backing sunshine. It is better to start in the early morning because the ibex usually grazes at the time, and then goes looking for an afternoon-rest place. One of the best ways is to find a convenient observation point on a top and watch the surroundings with a binocular or spyglass. At the same time, animals' often gopd merging into the background must be reckoned with. Spme contrasts of the background such as green flora can simplify the hunt, but a hunter needs a very good sight to see an animal if it keeps backed by rocks or stony ground especially in cross-country with harsh shadows. One can always start from watching the down before climbing, but ibexes are very sharp-sighted and very attentive to any upward movement because their natural enemies, wolves, usually come so. An open carriage with hay is probably the best trick to hide and watch from. As many other animals, the ibex doesn't practically fear horse-moved carriages, but will immediately run away as soon as it feels human presence. Having discovered an ibex flock, a hunter and a guide try to identify if there is a hunt-worthy specimen. If so, they jump from the carriage unseen, and the carriage goes away to distract animals attention. The hunter approaches as close as the shooting distance and fires. A specimen at the age of six or more is counted the best prey. The horns shall be no shorter than 60 cm. Before a shot one must think if the target animal will fall into an abyss where it's going to be impossible to fetch it from or get damaged. Sometimes the target may be had to move for a "safer" place through the hunter's shout or shot provided it doesn't see where the noise comes from. in the districts of Guba and Ismailly (Babadag Hunting Place). The hunt season is through June to November.